This application provides information on hundreds of ways you can heal your medical problems Islamically. Sunnate nabvi se Ilaj ka tarika janne k lie is book ko parhiye. Muhammad S.A.W ki zindagi se apne ilaj k tareke janiye aur islamic tareke se sehatyabi payie. Tib e Nabvi remedies are followed vastly by Muslim community in the whole world. He was provided with treasures of knowledge of every field and therefore he knew the best treatments for many diseases which is available to us today in the form of Tib e Nabvi. Rasool Allah(SAW) whenever treats his own diseases and someone else health problems Hazarat Muhammad(SAW) recommends them some medical tips from which people definitely get benefit. In front of these remedies any other physician remedies are outdated. In tib-e-nabvi there are two Types of diseases one is heart and second is bodily disease. These both types are mentioned in Quran. 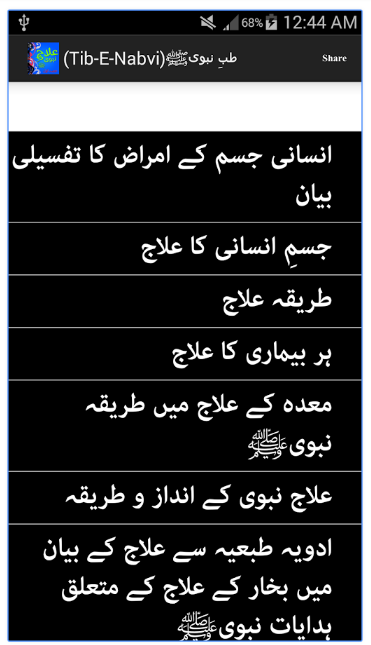 Top 5 Treatment of Tib e Nabvi in Urdu is as under. Whether it is summer or winter, autumn or spring, fever is a common disease to affect anyone. Learn about how to treat fever with Tibe Nabvi. Liver problems usually take place with aging. Here in this book you can find treatment for liver diseases. Honey is beneficial for health, known by everyone. But how and for what, this is not exactly known to many people. Read this book and know miraculous health benefits of honey, how and what to use it for.